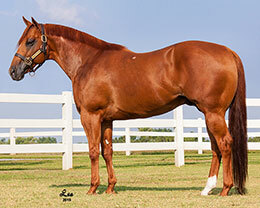 Dominyun sired 11th fastest West Texas Futurity qualifier Domynation from the nine trial races that were contested at Sunland Park Racetrack & Casino. SUNLAND PARK, NM�MARCH 24, 2017�Domynation, a $20,000 Heritage Place September Yearling Sale graduate, broke his maiden in her first start March 24th for owners Richard Young, Joe Yates and Linda Joiner. Ridden by jockey G.R. Carter, Jr., the sorrel gelding won the last of nine trials for the $230,100 West Texas FuturityWest Texas Futurity(G2) by one-length. His :15.391 cocking for the 300 yards was the 11th fastest of the day's nine trial races, giving him the top qualifying spot for the $50,000 West Texas Juvenile. Trainer Justin Joiner saddled the first-time winner by multiple stakes sire DOMINYUN. Bred by in Texas Bobby D. Cox, Domynation is out of the Grade 1 winning Leaving Memories mare Kathys Star Quest. The multiple graded mare won 11 of 30 career starts and earned more than $415,000. Eighty-one 2-year-old contested the nine races. The West Texas Juvenile final will be held Saturday, April 15th at Sunland Park Racetrack & Casino.